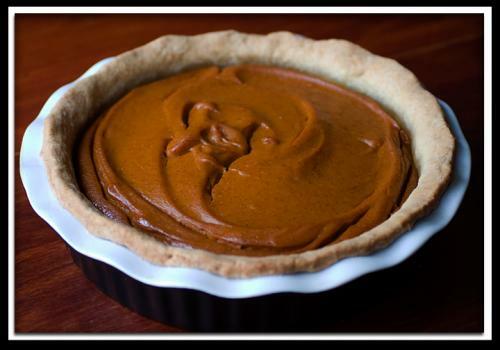 This is an amazing tofu pumpkin pie recipe that I shared a couple years ago, courtesy of Kind Lifer Megan Lipshultz. It’s so good and perfect for Thanksgiving – your non-veg friends will be amazed, I promise! Megan says this pumpkin pie recipe was originally submitted by vegweb.com user Robin, and it’s hands-down the best pumpkin pie I’ve ever had- ok, maybe 2nd to that insane pumpkin pie they make at Urth Caffe in LA, but still, considering it’s beyond easy to make, it’s freakin’ delicious. I’ve served this time and time again to tofu-haters and they have no clue it’s filled with it. Then, once the pie is safely in their bellies, I smile and tell them that it was super high in protein because of the tofu content. Gotta love that. I feel very 007 every time I make this. It’s a must to top the pie slices with Rice Whip or Soy Whip by Soyatoo! (exclamation point included in the brand name, just fyi) They sell these at Whole Foods and other specialty stores. If they don’t have this near you, ask your local grocery store to carry it! And careful, because some other brands of non-dairy whipped creams contain milk!! I know, crazy, right? It says non-dairy on the bottle, but you look at the ingredients and it says milk. Not sure how they get to advertise that as non-dairy, but oh well. Just be sure to check the label. For the tofu, I’ve found the Organic Firm Silken Tofu by Mori-Nu works the best. For the pie crust, get one from your grocer’s frozen section. Try for one that’s sugar-free. You don’t need a sweet crust because the pie is the bomb all on its own. I’m a spice freak, so I always use all the optional spices. I think the pie is best after it has been chilled (which is good because you can make it for a dinner the night or morning before), but it’s still awesome warm. All right, that’s enough on the pie. Go make it! Serve it to everyone you know. And if you’re really feeling crazy, pair it with some non-dairy vanilla ice cream, or if you are weird like me, pair it with the carrot cake ice cream from Rice Dream – yummmmm! Blend the pumpkin and sugar. Add salt, spices, cornstarch and tofu, mix thoroughly. Pour mixture into pie shell and bake for 15 minutes. Lower heat to 350 F and bake for another 60 minutes. NOTE: Don’t use the low fat tofu, then the pie tastes like it was made with tofu.